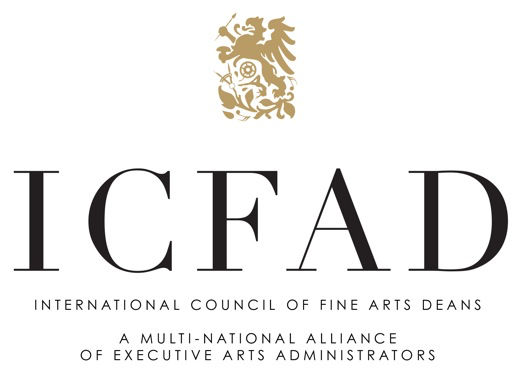 Founded on a shared passion and advocacy for the arts and a commitment to excellence in leadership, the International Council of Fine Arts Deans (ICFAD) is a multi-national alliance of executive arts administrators representing institutions of higher education. Your institution is invited to renew its membership for what is sure to be an engaging and worthwhile calendar year of membership, focusing on Deans Helping Deans. To determine whether or not your institution holds a current membership, please see our membership directory, beneath this “Membership” tab. Associate Membership is held by additional academic arts administrators (associate deans, assistant deans, department chairs, etc.) on behalf of the institution whose unit holds an Institutional Membership. The Associate member receives the full benefits of the organization, including discounted membership conference registration, but would not have voting privileges. There is no limit to the number of Associate members from any unit holding Institutional Membership. An Annual Conference. The 56th Annual Conference is scheduled for October 2 - 5, 2019 in Austin, Texas. Click here for a printable "save the date" flyer. After the 2018 Conference in Seattle, 97 percent of survey respondents said, "My participation at this conference will enhance my job performance." International Symposia. The ICFAD triennial international summer symposia are informative and educational experiences that address global issues in the arts and arts education. Join us in Barcelona, Spain in June 2020. Click here for a printable "save the date" flyer. Membership for everyone. Your Associate Deans, Assistant Deans, Department Chairs and Directors are welcome to participate as Associate Members. New this year: A membership level for your Development Officer, connecting that professional member of your team with others who fund-raise for the arts in higher education. Cultural Enrichment Experiences which members often attend with their donors. These events allow members and their development officers to express appreciation to donors, and to cultivate deeper relationships with them through special arts experiences. Professional Continuing Education. These programs are popular with those who are interested in growing leadership skills. Comprehensive data from our annual Executive Data Exchange. Formerly known as the Salary Survey, the questions and results have expanded to provide ICFAD members with information about budgets, staffing, programming and salaries from arts institutions of higher education. Website representation. The opportunity to include a photograph of an arts program from your institution on our website. Members simply send favorite horizontal images to [email protected] to take advantage of this opportunity. Representation at National Arts Advocacy Day: The National Arts Action Summit in Washington, DC. Representation at The Working Group on the Arts in Higher Education (WGAHE), representing NASM, NASAD, NAST, NASD. If your institution prefers to pay by check, please click here. To join and pay electronically, please see the links below, under each membership level description. Institutional Membership is held by the chief executive arts administrator of the academic unit or a designee on behalf of the institution. This membership receives the full benefits of the organization and holds the voting privileges of the unit. Recognizing that some institutions organize the arts disciplines into separate schools or colleges, with each reporting directly to the Chief Academic Officer, ICFAD also invites membership from institutions that have other administrative structures. In instances where institutions have more than one institutional representative, each Institutional Representative has one vote. Click here to complete the Institutional Membership application. In doing so, you will also have the ability to include additional members of your staff as Associate Members. Associate Membership is held by additional academic arts administrators (associate deans, assistant deans, etc.) on behalf of the institution whose unit holds an Institutional Membership. The Associate member receives the full benefits of the organization, including discounted membership conference registration, but would not have voting privileges. There is no limit to the number of Associate members from any unit holding Institutional Membership. Click here to add Associate members to your existing Institutional Membership. Corporations wishing to market their products or services to the Deans and other members of the International Council of Fine Arts Deans are invited to do so by joining at this level. Please click here to see the benefits of Affiliate Corporate membership. You may also print this document to send in with payment by check, if that is how your company wishes to join. Click here to complete the Affiliate: Corporate application. Distinguished Service designation is awarded by the Board to ICFAD members, who have served as deans, associate deans, or assistant deans, and have returned to the faculty, or transitioned to Provost or President position, having provided leadership for ICFAD or having been a long-time member. Distinguished Service recognition shall have the same rights, privileges and obligations as Associate members. Emeritus membership is awarded by the Board to ICFAD members in good standing who have served as deans and associate deans and have retired from higher education or have returned to the faculty. Emeritus Recognition shall have the same rights, privileges and obligations as Associate members.